If you enjoy hiking, sightseeing, fishing, or relaxing, then Amber Sands Resort is the place for you. We are located in Leelanau County, which offers a scenic, country getaway for couples and families. Our vacation resort is the ideal spot to plan a spring weekend getaway or color tour in the fall. Indulge in an amazing fishing experience in deep waters, or take one of the local charters out on the lake. There are guides available on our inland lake as well. Browse quaint and friendly shops in the villages of Leland, Suttons Bay, and Glen Arbor. Attend an outdoor concert at Interlochen's National Band Camp, swim in Lake Leelanau, which is a clear, clean lake, or tack a westerly breeze in your day sailer! Schedule a charter fishing trip in Leland, and land a king salmon, lake trout, or one of our famous white fish. Dine at one of Leelanau's splendid restaurants, and then try your luck at Leelanau Sands Casino. Relax around a roaring, evening campfire framed against a vivid late summer sunset, stargaze the Milky Way and Big Dipper, or even witness the Northern Lights on occasion! Come and enjoy our clean and comfortable cottages. We have a track record of providing consistent, reliable housekeeping services for more than 40 years. Our goal is to ensure that you are having a great time. That is why we provide a wide variety of amenities to keep you satisfied during your stay with us. Book a vacation that you will never forget. 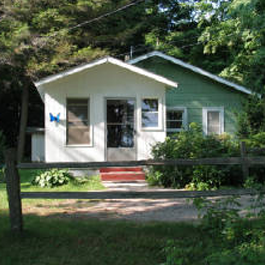 We have weekly and daily cottage rentals available. We are closed from the first of November until the end of April. 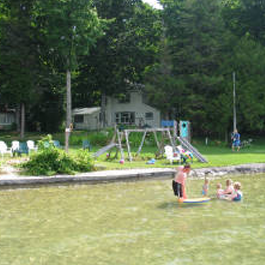 Amber Sands Resort is a seasonal vacation resort located on the sunset (east) side of South Lake Leelanau. Our resort is 12 miles northwest of Traverse City, Michigan, in the heart of Leelanau County. We rent six cottages, and our resort has 500 feet of lake frontage with boat dockage space, walking docks, and a sandy swimming area. 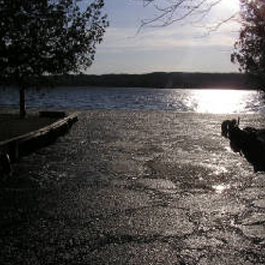 If you're in need of lodging or an accommodation near Traverse City, contact us. Count on us, as we are the 19th oldest business in Leelanau County. We began operations in the summer of 1951. We have a lot in store for you. The spectacular Sleeping Bear Dunes National Lakeshore Park and 38 miles of hardwoods, pines, dunes, and beaches are only a short drive from Amber Sands Resort. Discover a remote Lake Michigan beach and chase azure waves on a pristine, sandy, and uncrowded beach. Drive or bike a wine tour of Leelanau County's award winning vineyards, which produce nationally-acclaimed table wines. Nearby Leelanau fruit orchards grow outstanding sweet and tart cherries, as well as an ample variety of apple, pear and peach. Leelanau County farmer's markets and produce stands are open from mid-May through the end of October. Jim and Paula Meyer have lived at, and managed, Amber Sands Resort for the past 40 years. The Meyers have four children who, having grown up at the resort, have learned firsthand the meaning of hospitality and customer satisfaction. Many guests return to Amber Sands year after year - a number of families have returned for more than 20 years. We invite you to come and stay in the Land of Enchantment.